The album cycle that began with “Rock DJ” a year before staggers to its end four singles later with “The Road To Mandalay”, a bitter squib of a song, pulled from the end of Sing When You’re Winning and paired with new track “Eternity”. “Rock DJ” was a party song with an undercurrent of spite – by this double A-Side, the party’s been over for quite some time. The spite remains. “Eternity” tries its best to be gracious. It’s written about Geri Halliwell, whose friendship and brief fling with Williams had tabloid editors pinching themselves the year before. You wonder what she made of it. The song has sympathy for a fellow inhabitant of the goldfish bowl, but it’s sympathy with a rather morose edge to it: “The past is gone, we’ve been betrayed”. If Geri hoped for a second “Angels” to commemorate her holiday romance, she’d have been disappointed. “Sombre serenade” is about right – “Eternity” is a lead-footed, despondent song that makes gestures toward soaring but can’t lift its sodden wings. “I hope you find your freedom… for eternity” Robbie keeps singing, the words so big they sound gaseous and insincere. When, right at the end, he switches “…for eternity” to “…eventually”, it’s the first time anything in the song has felt true. He’s singing – as usual – about himself. “Youth is wasted on the young / Before you know it’s come and gone too soon”: the 26-year old Robbie was the country’s biggest star by leagues, aloft on 6 million album sales. But like many successful people he’s driven by an itch, not a goal; defined by his dissatisfaction. He’s always checking for exits. It’s a useful instinct – he chose a good time to ditch Take That, and soon he’ll be edging Guy Chambers towards the door (they have one more collaborative triumph to come, “Feel”, but it’s a demo from their 1999 heyday). The treacly “Eternity” shows a partnership low on steam. Not the Robbie I prefer to remember either. I never realised “Eternity” was about Geri. In fact I’d forgotten they had been an item. The “youth is wasted on the young” line had a pang of familiarity to it, but otherwise this was sad Robbie at his least compelling. This was the second time Robbie had used a clever marketing trick; pairing the last release from an album with a new track to keep his commercial fortunes afloat. By the end of the decade we’ll have the trend of re-issuing albums with a mini album of new tracks but nobody else seems to have aped Robbie’s technique here. 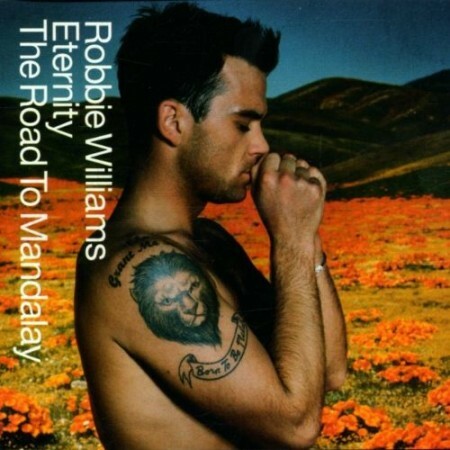 Eternity was the track that sold the single; I never heard The Road To Mandalay until I belatedly bought the album many years later. It was a sizeable hit at the time; a two weeker (Robbie’s first as a soloist) and held off D12 (Eminem’s side project) with Purple Pills. Not only that but after dropping to number three it rebounded to two when a single by a major pop act shot its bolt. I have a lot of fondness for Williams these days – particularly after the next album and his more recent work, which I doubt we’ll see much of here. At the time I took him for a narcissist, particularly given his usual subject matter. But the way he’s kept making records, kept developing his style (and probably lost his shot at international success in the process)… call me naïve but I sense a genuine love for music underneath it all. The Road to Mandalay is a bore, but I find something endearing in Eternity. I always forget that Feel wasn’t a number one. Number four feels a real injustice. It’s an enormous, desperate prayer of a song. Easily his best. What a chorus. We get to discuss him once more before Feel comes along but the Escapology album was unusually released before the lead off single which damaged Feel’s chances of getting to number one. That said there were two very hyped new releases that week which may have been another factor. Both during and after the Guy Chambers era, Robbie Williams was always curiously introspective for such a mass market sort of pop star. It’s a big part of his appeal – even his earlier, broader hits tended towards analyzing and deconstructing the tension between his cheerful public persona and his more conflicted inner life. The moment he chose to very pointedly cover George Michael’s ‘Freedom’ in the wake of his exit from Take That, through to the cheekily self-aware ‘Let Me Entertain You’ and the confessional ‘Strong’, almost everything he released was a new chapter in the ongoing public diary of what it’s like to be Robbie Williams. My strongest impression of this chapter in his career is that it’s the time when the ‘cheeky chappie’ side of his persona started to grate, his showman smile freezing into a rictus grin. You get the impression that he would have liked to kill this particular Robbie identity off completely. But he never quite seemed to be able to figure out how to do it. He was no David Bowie, and much as he may have come to resent ‘showman Robbie’, it was and remains a part of him that’s too deeply embedded to ever be totally cast off. This made the next few years of his career quite awkwarly fascinating, as he tried and for the most part failed to push against the limitations of the Robbie Williams brand and what his audience wanted from him. We had classical Robbie – a big hit that we’ll discuss elsewhere – then experimental Robbie, which wasn’t. Since then, I struggle to place exactly what role he fills in the pop stratosphere, though he’s still very much part of it. There’ve been the retreats, the crowd-pleasing defensive maneuvers, the occasional odditys that suggest he hasn’t totally checked out. I find these both rather charming – perhaps in particular “Mandalay”, the idea that the country’s biggest pop star should release something quite so leftfield, a downbeat opening shifting gears gently into something resembling the Divine Comedy’s “National Express”, and for a moment, since everyone’s thinking of Bowie just now, there’s an echo of the pre-fame Anthony Newleyisms. “Eternity” is a good shot at another Angels I guess, but not just that – an elegiac end of summer/end of relationship hybrid which I definitely like, although could have done with a bit of editing as its last minute and a half add nothing. I was probably still up to my elbows in twins’ nappies at this point, because the videos to both were unfamiliar to me. A nice original touch – two videos that were companion pieces, much in the style of The Italian Job, with Rob larking about with his mates in Italia 90 lads’ footy holiday mode, until both the crime caper and the romance come to an end. Rob is carted off and you know the 90s are over. So, you suppose, was his imperial phase. ‘Eternity’ is definitely a coda for his imperial phase, although he never really stops being interesting until ‘Take The Crown’. I think it’s a lovely, sparse little song and it almost feels as if Robbie is singing about his fans as much as he is the ginger one. There’s many good songs to come of course, but he’s never quite at the centre of the nations thoughts again. Good video as ever, too. I dunno about that, there’s a whole bunch of bunnies and near misses to come shortly, and previous to this one there’s a bunch that did’t quite get to the top that we could all sing the chorus to. Often enough, it’s pure timing: Nothing else sold more than this, this week(s). For all that list of “Singles unfairly held back at number two” there’s a bunch of “Singles that got lucky”, think this might be one. Oh man, Elevation by U2 entered at number 3 this week. The start of U2’s gosh-awful phase where every album would have a lead single spun out of pure bluster and one weak riff, which would inexplicably crash in near the top of the chart. More than a decade later I can’t detect a shred of appeal in any of them. I don’t much like either of the Robbie songs but I can see what others might enjoy. He was very sure of his fame at this point: I remember he performed Eternity on TOTP in a terrible jumper and said “don’t be scared, it’s only knitwear” in the middle. Elevation wasn’t the lead track for that album though. My memory is that it was at least 3rd out of the traps (behind Beautiful Day and Stuck In A Moment) and was only given a push because it was on the soundtrack for one of the Angelina Jolie Tomb Raider films. I don’t disagree with the general thrust of your point though. #2: Mildly disappointed that this held “Purple Pills” off the #1 slot – though I don’t have much memory of the original version of it, as the one that took hold in my head was the mash up with Pigbag’s “Papa’s Got A Brand New Pigbag”. Still, though I can take or leave a lot of Eminem’s output and find his humour is decidedly an acquired taste, the narcotic way that “Purple Pills”‘ chorus dissolves into “something, something, something, I don’t know” was one moment that I found genuinely funny in his output. I think this must be the first time I’ve ever heard “Road To Mandalay”, and it’s been a pleasant surprise. True, I’m not planning to go to iTunes after typing this and buy it, but it has a rueful acoustic indie feel to it which seems strangely uncharacteristic of most of his work, and if placed two thirds of the way through an album of stronger material by a band I’m genuinely a fan of I probably wouldn’t complain (faint praise, I’m full of it). B&S and Divine Comedy inspired, certainly, though the end result does sound slightly like one of those vaguely alternative acts that turns up in the semi-final of the Eurovision Song Contest and doesn’t qualify. But y’know… I’ve bought tracks by some of those people. Watching videos of a youthful Robbie goofing around also makes me feel horribly, horribly old now, which suits the melancholia present in the track well. It won’t have felt that way at the time, though, obviously. But yep, sad that “Purple Pills” was held off the top spot, which of the two tracks has certainly been the more enduring. I’ve been surprised how much I’ve liked Robbie’s run of millennial number ones; it must be the Guy Chambers/Divine Comedy connection, as others have pointed out here. For that reason, I actually found “Mandalay” a more novel listen than “Eternity”, sounding more like a DC off-cut than a chart-topper. Between the two of them, I could stretch to a 6. Feel like Eternity has been underrated a little here. It’s really crept up on me in recent months, not least because of the affecting lyrics that reflect a current situation but also its spaced-out and melancholic feel that threatens to veer close to “mood music” at points but yet mangages to keep my engagement in the song active. The Road To Mandalay, as has been mentioned, is some sort of odd mix of a sub-Divine Comedy knees-up and the same sort of pensive sadness seen in Eternity. He mangages to pull it off though. 8 for Eternity, 6 for The Road To Mandalay. This single also seems to demonstrate very well Robbie’s star power at the time as these songs don’t seem very commerical outside of the provenance that Robbie provides.